KYOCERA Corporation (President: Hideo Tanimoto) announced that its Amcenna IoT antenna has received Japan's Minister of Internal Affairs and Communications Award. Amcenna, a compact antenna that performs well even when mounted on metals or near water, was recognized during the 2018 CEATEC Awards, organized by CEATEC JAPAN 2018 — one of Asia's largest IT and electronics tradeshows. To create Amcenna, Kyocera miniaturized an Artificial Magnetic Conductor (AMC) and integrated an antenna function into the AMC itself. The result is an exceptionally thin, compact antenna that can operate in close proximity to metals or water with no loss of performance. 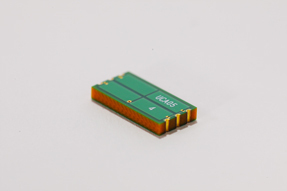 In combination with its compact form factor (7.0×13.6×1.9mm at 2.4GHz), Amcenna's unique performance can allow IoT devices to be installed in a wider range of applications — including on manufacturing equipment, on metallic automotive body panels, and in wearable devices, to name just a few examples. Radio waves experience a 180-degree phase shift when reflected by metals. Consequently, waves emitted from an antenna can be canceled by radio waves reflected from the metal. Traditional solutions have involved using an AMC and a separate antenna to interrupt reflection but this method impedes miniaturization. In designing Amcenna, Kyocera sought to create a new type of antenna that can be miniaturized significantly while solving these performance challenges. Inspired by three-fold mirrors, Kyocera's proprietary Amcenna design produces an AMC consisting of just a few cells electromagnetically equivalent to an infinite periodic structure. This approach reduced surface area to 1/60 as compared to Kyocera prototype antenna using conventional AMC technology. 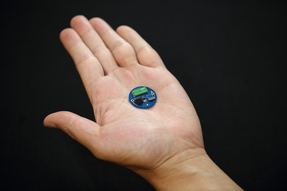 Amcenna will support miniaturized applications, such as wearable devices, while experiencing no performance degradation when mounted on metals or near water. Kyocera plans to develop Amcenna-based solutions for a wide range of applications, including IoT systems for manufacturing sites, wearable technology and other IoT innovations. Award Review Panel evaluated entry exhibits and selected for recognition those deemed to be most innovative and sophisticated. This year marks the 8th of the awards.